Its taken a few days to let all this sink in, but i have to share. I am a bit disappointed and also happy too for what i saw on Friday night in AC. The Borgata completely stunk...The room was a sound nightmare. Albiet i had horible seats way in the back but i have had similar seats and never dealt with deafening sounds like i heard....Maybe im getting old and deaf- but i thought the mix was horrid- maybe up front it was better..
BD--- you really put a spin on songs that was really well accepted- sometimes I'd like to hear your version before or after jons to get that other perspective, but lets see if they release any live shows...please? Thank you for singing your heart out! I posted elsewhere that the set was absurdly short due to the venue. I complained about it there and will not repeat it here. Suffice it to say that despite the short set, the evening was magical for me. On a personal note, 102.9 WMGK was there broadcasting live. They did an "Owner of a Lonely Heart" game where you had to guess how many times various classic rock musicians have gotten divorced. My friend and I gave it a go and won a couple of radio station t-shirts. They also had a text message raffle for a first row seat. On a lark my friend and I both sent text messages. After a while it got close to show time and I wanted to take our seats, but he said "no way, we're going to win those 1rst row seats". Wouldn't you know it, but 2 minutes later we won the tickets! So, we moved up a couple of dozen rows for out front row seats! 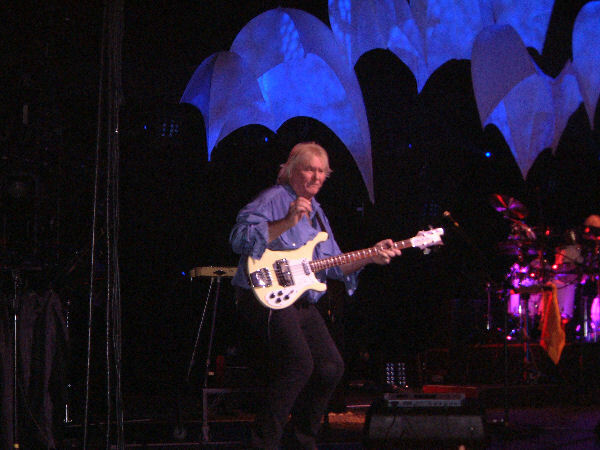 directly in front of Chris Squire. So, needless to say it was awesome just on this note alone for me. BD: very good. Great stage presence. Moves around and interacts with the band and the audience very well and in a more "normal" sort of way as compared to JA. He also moves and dances a lot to the music (and according to its rhythm too! ), so this is different from JA also. Obviously no spacey talk. Over all, a very good performance. Of course, we all missed JA but BD made us feel right at home. SH: really hot. He's a strange guy, people say he is slowing the band down in terms of tempo. However, his performance is hot and cold in terms of speed. A few moments he is playing either slower or less notes than the album or previous performances in years past (i.e. : TF). Other times (such as "Wurm") he is blisteringly fast. So, I cannot tell if he thinks playing slower is more mature or refined or he can only sustain it occasionally. He got really angry at least twice during the show. While introducing AT he told some folks in the audience to "shut up" because he was talking. During the quiet part of "I Get Up, I Get Down" when CS is doing some noodling, he looked toward those same folks with a look that could kill and mouthed "shut up" and made a motion with his hand to tell them to keep it down. Overall, his performance was spot on and he was very animated at times. AW; same as always: solid. OW: I think he does not get the credit he deserves. He was mixed somewhat lower than RW. However, I have found with the exception of perhaps PM, every keyboardist is mixed lower than RW. There was at least one time when SH motioned to the sound guy to turn OW down - I cannot for the life of me remember what song that was. What he did play was spot on like the albums. I think his main "problem" if it is one, is that he has absolutely ZERO stage presence. He never looks at the audience and only acknowldged the band (CS specifically) one time that I can remember (during the "Roundabout" solo). When he has no keyboard part to play he often clasped his hands in front of himself looking at the floor. He also does not make his playing look challeging. He uses a smaller rig than RW, taking full advantage of new technology (unlike RW who seems to enjoy using 1,000,000 keyboards all of the time). He rarely played more than one at one time and does not sway/leap/run back and forth between them or, as RW did in 2002 - 2004, criss-cross his hands constantly. I guess it can be summed up by saying OW has no stage presence and no showmanship and I think a lot of people confuse that with inferior keyboard playing which is, I think, a mistake. 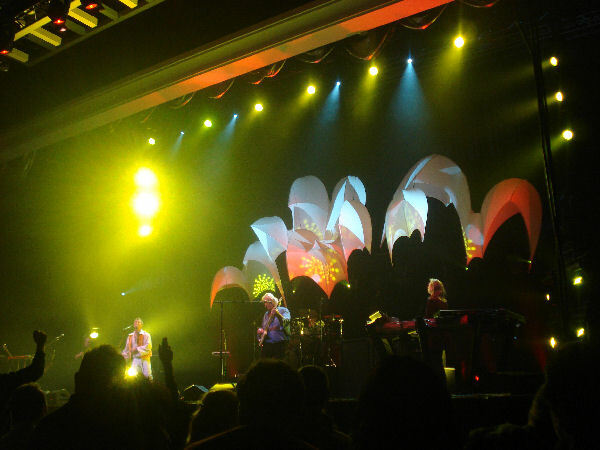 Great show, BD vocals soared on CTTE and AYAI, very strong and on key, but his own phrasing, not a JA mimic. Great to hear the Drama songs, Onward and Astral Travler. Great sound and responsive crowd. Oliver had his own style and played well with a couple of flubs, Steve's had guitar problems during Roundabout. Bad points, my GF brought me the tickets and paided way to much from a reseller. Short set, really missed SH acoustic solos, no Parrallels, Soon, LDR/Fish, Aliens. Sound guy said it was because of the Casino. At least the Borgata should have advertised that your not getting a whole concert when paying a full ticket price. Typical Atlantic City/Casino ripoff, just like their over priced drinks. Hey guys please come back to the Tweeter Center and play a whole show for us. The Yesshow was great sound wise meaning much better than Asbury Park. It was clearer and not muddy. I was in the 6th Row vs 10th Row in Asbury Park. Setlist also a plus becuse it was different but too short. Previous Post has the Setlist right. In Asbury Park they played Paralells after the break there was no break in Atlantic City. So no Parallels, SDteve Acoustic Solos, Soon From Realyer and no Long Distance/Fish and The song Chris Sang. Thats alot. But we got Machine Messiah and Owner in their place. Maybe they playeed Owner in Asbury I dont care for Yeswest so I sat through it. Just returned from the Yes show and I have to say it was spectacular. Definitely one of my top concerts. I saw them at the Borgota 2004, which was fine show as well, with them playing acoustic versions of Roundabout and Owner of a Lonely Heart. 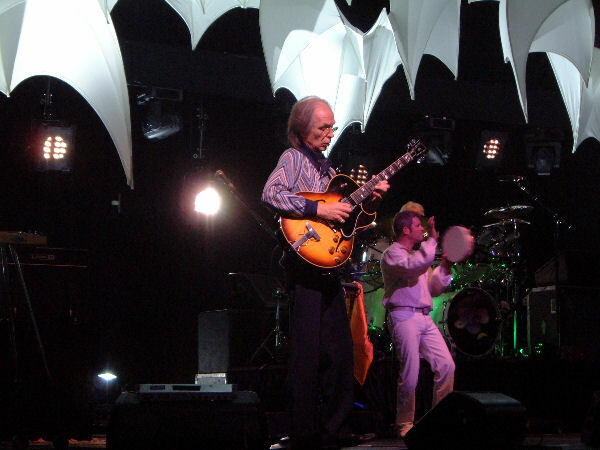 Steve Howe and Chris Squire seemed to produced the most energy on stage tonight. 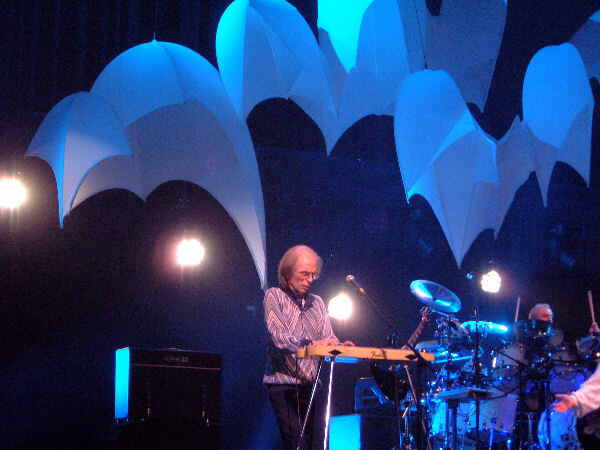 Howe�s solos, particularly on Starship Trooper, which was the best song of the night for me, were sweltering and passionate. He even had some fun with crowd, vehemently instructing a rude audience member to �shut up� while he introduced the next song. Squire�s bass sound was more powerful than I could ever imagine. What a phenomenal talent he is. Alan White was Alan White. Never a big fan is, always preferred Bruford�s jazzier and more improvised playing, but he sounded acceptably good nonetheless. Benoit David was excellent, certainly exceeding all expectations. 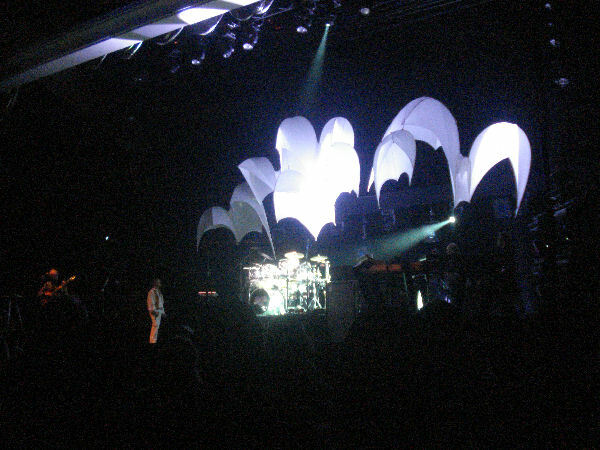 While he lacked Jon�s stage presence, he hit every note just fine. Oliver Wakeman...well...I just thought he was kind of �there.� He didn�t have a tremendous amount of solos, and when he played he seemed to play decently, but he didn�t stand out by any means. 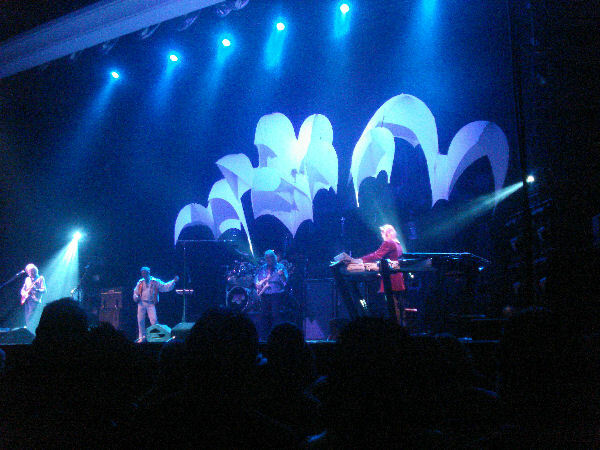 At times, I almost forgot Yes even had a keyboardist. Rick�s presence was sorely missed. My only disappointment is this is the shortest setlist of the tour so far. I was looking forward to hearing �Aliens�, �Long Distance Runaround/Fish� , and �Parallels�, but sadly none of these were played. 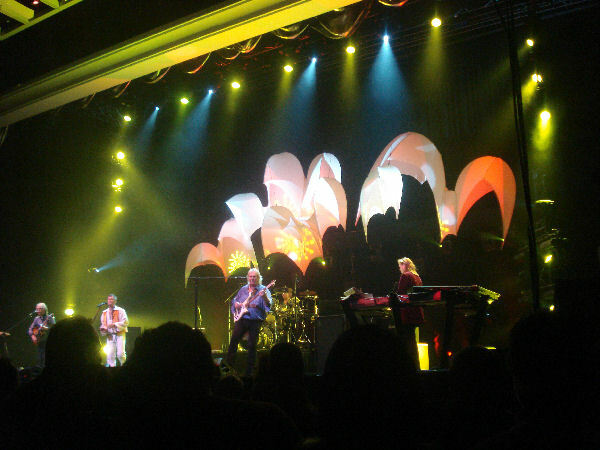 �Siberian Khatru� was a fantastic opener, although Howe flubbed a lick or two in the beginning of the song. He continued this uncharacteristic clumsiness in the beginning of �I�ve Seen all Good People,� but he was strong for the rest of show. Close to the Edge was amazing, as was Machine Messiah, a track I must ashamedly admit I had never heard previously. 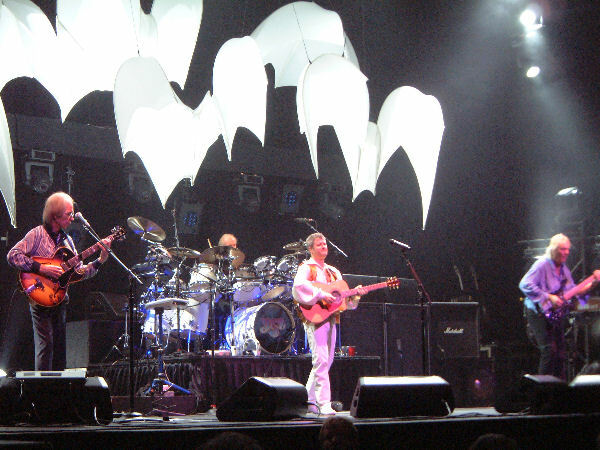 Having seen Yes twice, two tunes I still look forward to hearing would be �Yours is No Disgrace� and �Heart of the Sunrise,� the latter which was unfortunately dropped after the first few dates of this tour. 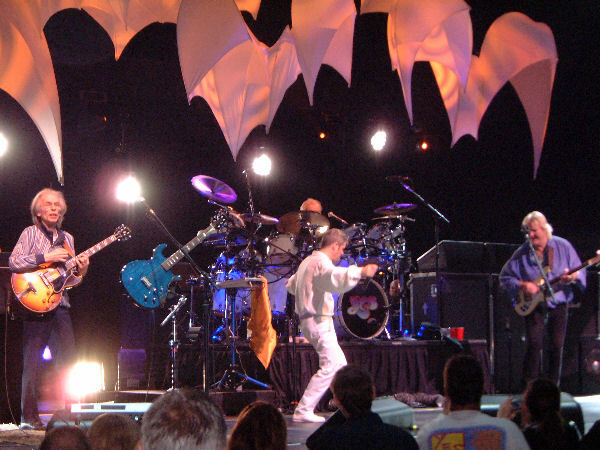 I certainly plan to see Yes again once they tour with Jon.